Today is another post based off of a photo my sister sent to me. This time.. eyes! You know.. the creepy eyes that stare at you in the dark of night. Did I set up good enough imagery for you? Perfect! Shall we continue? THIS is the photo I based this look off of - I scoped the watermark, but could not find a direct site, but still wanted to share the photo! I added two extra colours for eyes.. because.. let's just make it as creepy as possible! Ohh hoo!! Sooo fun! 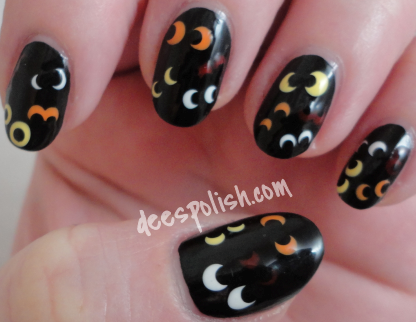 Honestly, I wish I had some glow in the dark polish.. could you imagine this look featuring glow in the dark polish?? Be still my heart. I just love how these turned out! 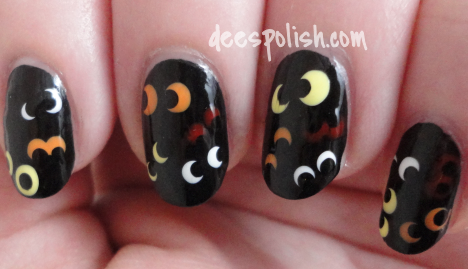 If I didn't already have a different idea for my own personal nails for Halloween, I would happily sport these.